Description - Shaw's Easy Vision luxury vinyl tiles feature a hand-stained concrete visual for a trendy and contemporary look. 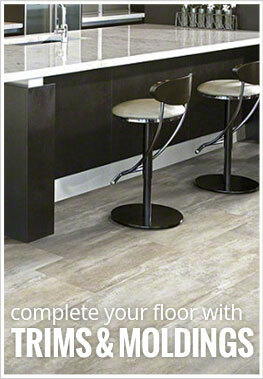 This modern collection comes in large 12” x 24” tiles to meet the demanding needs of today’s flooring trends. Three beautiful colors feature multi-tone staining and a unique slight metallic finish. These vinyl tiles can be installed on any level of the home and are very easy to clean and maintain, unlike traditional hardwood or concrete floors. Backed by a lifetime residential warranty and featuring a thick 20mil wear layer, your stain resistant LVT flooring is sure to be just as durable and beautiful for decades to come. Material – Shaw vinyl flooring is constructed with virgin vinyl and contains no hazardous metals or chemicals. Easy Vision tiles are complete with a durable ArmourBead surface finish for unsurpassed durability. Size – Luxury Vinyl Tiles are 12" wide x 24" long. Weight – Each vinyl plank weighs ~3 lbs. Recommended Uses – Shaw Easy Vision vinyl flooring tiles have been installed successfully in residential and commercial applications. This resilient flooring can be found in office buildings, cafeterias, office waiting rooms, bedrooms, kitchens, dining rooms, bathrooms, as basement flooring, home offices, in family rooms and much more. Modern 12" x 24" tiles. Resistant to staining, wearing, and fading. Perfect for any level of the home. Complete with ArmourBead surface finish. Can be installed loose lay, perimeter glue, or our 5900 Series adhesive all over. We installed the Rosemary color in the basement and it makes the whole area look more finished and modern. Very pleased! I put the water chestnut in my bedroom and now it looks 'luxury'. Looks great with the decor, I bought some new 'light' type of sheets and I LOVE my bedroom update :) Thanks!